At Integrity, we’re committed to helping you maintain your vehicle. 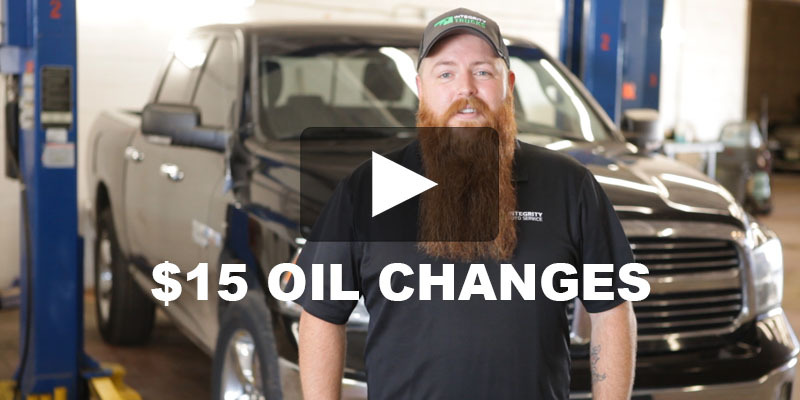 Learn about our $15 Oil Change program and the importance of regular maintenance in the video below. Preston Miller (Integrity Auto Service): Did you know it’s your responsibility to have your oil changed every 3,000 miles? Regular maintenance is one of the most important things you can do to prolong the life of your vehicle and get the best performance possible. A vehicle that hasn’t been maintained won’t perform to its full potential. Worst of all, a vehicle that hasn’t been maintained could leave you stranded on the side of the road and could potentially cost you a lot of money in unnecessary repairs. Integrity is dedicated to helping you keep your vehicle in the best shape as possible. That’s why we offer our $15 Oil Change program for the life of your auto loan. For only $15, our service department will change your oil and filter using a great quality full synthetic oil, and check all the important stuff, like your belt, your fluids, your tires, all your lights. And, as always, our service department will never try to sell you something that your vehicle doesn’t need. So let us help you protect your investment. Getting a $15 oil change is way smarter than stranded on the side of the road and way easier on your bank account for replacing a $3,000 engine. The easiest way to keep your vehicle reliable and performing great is to take advantage of our $15 Oil Change program. Details like this are what separate us from the other guys. That’s Integrity! Narrator: For the past four years, Integrity has been chosen as one of the best places to buy a used car. One reason for this is our Heartland Service Plan that provides a true warranty after the sale. Our plan is approved and licensed by the State of Oklahoma Insurance Department, so you know it’s legitimate. Preston Miller (Integrity Auto Service): Just because you buy a car here in Oklahoma City, it doesn’t mean that you have to bring the car back to us for service. People go on vacation, you might move out of town, and you might need your car serviced. With our Heartland Service Plan, you can take your vehicle to any reputable service center in the country, no matter where you are. Michael: Cars I’ve bought in the past, they don’t compare to the experience that I’ve found here. Here you at least have the Heartland Service Plan, and that’s ideal when it comes to buying any car. You want that reassurance that you’re going to be able to take this car and get it fixed, and not have to spend astronomical numbers trying to get it repaired just to keep your family in something safe. Matt Williamson (Integrity Auto Service): I am the guy you call when you need to schedule an appointment for service, whether it’s for a basic oil change or something more serious. Our service department is here to assist you if you even think that there’s something wrong. Go ahead and give us a call — you’re car will usually give you a heads-up that something may not be right. These red flags are things like your ‘check engine’ light coming on, something making a weird sound that normally wasn’t there, or even an odd smell. So don’t wait until your vehicle breaks down — go ahead and give us a call the first time you think something is wrong. Chances are, your repairs may be covered under your Heartland Service Plan, and you deductible is only $150. That’s way cheaper and easier than having your vehicle towed in for repairs if you break down. We’re dedicated to helping you keep your vehicle on the road, preforming to the best of its abilities. Now that’s Integrity! Ralph: At this point right now I have three vehicles through Integrity Auto Finance. I have two work trucks, and I have a 2013 Ford Explorer that I use for my family. I’ve been using them for the past six or seven years; I’m probably eight trucks into it. Hope: I love driving my car! Maria: I love my car because it’s roomy and efficient; it’s great on gas and gets me where I need to go! Tammera: I love everything about my car! It has heated seats! Jacqueline: I love the interior, the leather interior. It’s clean — there’s no wear and tear on the car. Marcellous: The car is a wonderful car. It had low miles when I purchased it. Stacie: You have so many options of cars you can choose from, it’s ridiculous! You can’t imagine! Improve Your Credit with Integrity! Dontay Pompey (Sales Manager): Did you know that making payments on a car loan is one of the best ways to increase your credit score? Well, here at Integrity Auto Finance, we report to all three credit bureaus just to ensure that your on-time payments help improve your credit!